7 inch industrial PCAP touch panel, support operation with gloves, water , and thick tempered glass or PC on top of the cover glass, mainly used in medical, industrial, security, home appliances and other fields; Custom processing such as surface treatment --AG,AR,AF available, resolution and brightness optional, etc. 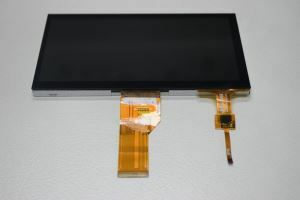 Capacitive touch screen has been increasingly used in various fields with rapid technology development. In order to meet different requirements of worldwide customers, GraHowlet supply all kinds of product structures such as G + G, G + F (G + F + F ),P + G, etc. and various technical support programs such as Cypress , Atmel, EETI, FocalTech, Goodix etc. according to different application environments. 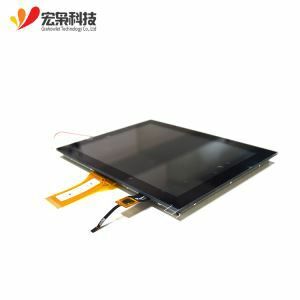 Requirements of capacitive touch screen are not very high in this field ranging between pure industry and consumer applications. End products are express logistics hand-held terminals, hand-held POS terminals, convenient payment terminals, self-service terminals. They are mainly used in indoor environments and occasionally used in outdoor applications. These terminal products mainly pursue lightness and portability, so G + F (F) structure is generally recommended and G+G structure is chose by a small number of customers to be cost-effective. 3.Pass high and low temperature aging test and tumbling test. 3.Overall module joint assembly with FPC screened. Q1:Can you provide OEM service? yes, we can provide both OEM and ODM service，can customize products according to the drawings you supply. Q2: Is your company a real manufacturer? Our company is a comprehensive service provider of capacitive touch screen in developing and manufaruing for many industries, we have our long-term business factories but the solution design & products developing and software debugging are all completed by ourselves.you are warmly welcomed to visit our factory anytime. Q3: How is the quality of the product? Q4: Does the product only use for industry? Our products use in medical, internet of things, vehicle-monnted industry, intelligent houesehold, outdoor equipment and many other industries. Q5: How can I trust your product quality? Q6: What's your after-sale service?